Paul Dickov is confident he will have the vast majority of his Rovers squad assembled in time for the pre-season training camp in Portugal. Dickov had hoped to have had much of his summer business done before Rovers return to training on Monday. But he his convinced his recruitment programme will be close to completion by the time the squad jets off to southern Portugal in a fortnight. “I’m comfortable with where we are at now,” Dickov said. “We’re speaking to players. “We want to make sure we’re bringing in the right players rather than panicking. “As much as we want to get the right ones in, it’s important we’re patient with it. “I said at the end of last season we wanted to get a majority of the new signings in the door by the start of pre-season. “If not then, by the time we go to Portugal. 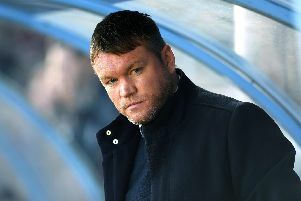 Dickov has ticked off two major items from his summer transfer wishlist with the signings of goalkeeper Thorsten Stuckmann and striker Andy Williams. But he remains light on defensive cover with the squad due back at Cantley Park on Monday. Mitchell Lund – who yesterday penned a new two-year deal – is the club’s only recognised senior right back with Cedric Evina the lone left back in the squad. Signing two new full backs is a priority, as is adding further cover at centre half with versatility and pace high on Dickov’s list of wanted attributes. The 18-year-old’s new deal takes Rovers’ current squad up to 14 senior players with Harry Middleton and Billy Whitehouse both poised to pen new two-year contracts.